On the evening of 26 July, the crew of the ‘VOS THEIA’ was en route to Tripoli, Libya, when they received a phone call from the Italian Coastguard with an unforeseen request. Apparently, due to the rough water of that evening, there was a badly damaged rubber boat that was sinking rapidly, not far from the VOS THEIA. Captain Sergey Flora, who was in command of the VOS THEIA, was requested to aid and rescue the rubber boat in distress. 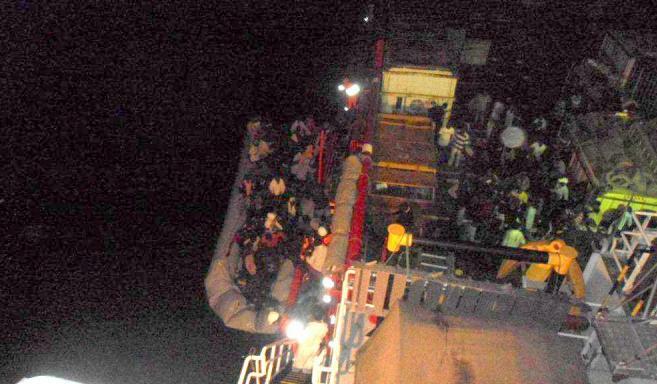 The boat, that was heading for Italy, had over 100 Algerian refugees aboard. However, the hazardous circumstances had caused them to get into difficulties somewhere off the coast of Libya. Together with his thirteen crew members, Captain Flora rushed to the scene; with full speed on the rough water and strong current this was quite a challenge. The authorities had informed the Captain that it was a security level 1 rescue and therefore to approach the rubber boat with caution. “It was quite a nerve-racking event”, Captain Flora admits, “I instructed my crew to be very careful, as the probability was there that the refugees might be armed with weapons.” When Captain Flora and his crew approached the sinking rubber boat, the Captain was slightly shocked by what he saw: “If we had arrived slightly later, the boat would have sunken and the refugees would have ended up lost at sea.” The Gibraltar Maritime Administration and the nearby NATO forces who had been in continuous contact with Captain Flora throughout the rescue, stated afterwards that the refugees must have been on the water for over two days.